T-Mobile prepaid activation is easy except for one item. A simple one-page form is marred by a confusing question about regions. This one stupid flaw may have you scratching your head like I did mine. See if it matters to you here. Charge it for a few hours. On your computer, go to the T-Mobile prepaid activation URL. You just enter your personal information. Then you enter the SIM card serial number and handset serial number which are printed on a label on the package. The stupid part happens once you choose your desired area code. This is the area code for where you live and where you’ll be using your phone. Once you choose the area code, the page refreshed and you have to choose the city nearest you. 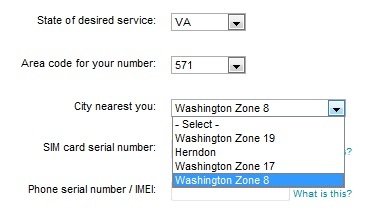 These are the choices I get: Herndon, Washington Zone 17, Washington Zone 19 or Washington Zone 8! How is anyone supposed to know what these are? I searched high and low on the internet (okay, only about two minutes really). I found nothing. In the end, I blindly chose one of the zones. This doesn't happen when activating phones on other plans, but it's not that bad . . . .
Once you enter the activation code which is located on the Activation Card in the package, you can go ahead and click the activation button. In a couple of seconds, you are taken to a new web page which confirms that your activation has been successful. 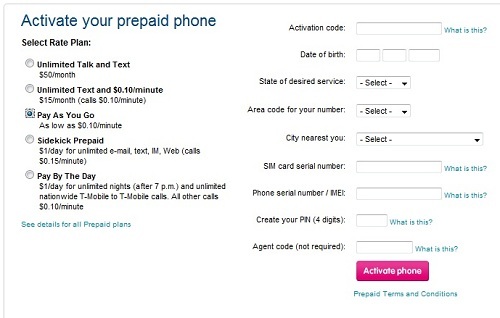 Your new number is listed along with your introductory set of 10 airtime minutes worth $3.34. Interestingly, when you first activate your phone, your service is valid for 90 days. This is longer than Tracfone which initially gives you just 60 days. If you got a deal which offered additional free airtime, you can go ahead and add that now. A few minutes later a text message arrives on the phone itself, confirming that the phone has indeed been activated and is ready for use. So as you can see this is much simpler that Tracfone and Net10’s multi-page activation process. The only drawback is that cryptic calling zone. If you happen to run into that situation, just take a guess. Since there are no roaming charges anyway, you should be okay. Here are a few other examples of activating your cell phone. Thankfully, most plans no longer have an activation fee. Here's how you activate a Tracfone handset. Remember, some of these handsets actually use T-Mobile's network, but their process doesn't force you to make cryptic choices. Here's an example of activating a Kajeet phone. This plan uses CDMA phones on the Sprint network. The Straight Talk plan uses all four networks depending on the phone. This activation example shows the procedure for a handset on the Verizon network.